Living on the coast of British Columbia has given me many opportunities to watch the antics of Killer Whales . I am fortunate to be able to spend many hours on the waters of the Strait of Georgia, Johnstone Strait, and, in recent years, on the west coast of Vancouver Island and on the Inside Passage. These are all key locations for Killer Whale pods in British Columbia. My sighting of Killer Whales have usually occurred while I have been salmon fishing, and, often in remote locations. The most recent however, happened while I was motoring back to the boat launch in Comox Bay. I was traveling towards the evening sun on flat glassy calm waters along the front of Komass Bluffs. Native history highlights this particular bluff as a lookout for the local Coast Salish Indians. It was here that they were able to spot the war canoes of wandering Haida warriors. On this particular trip, as I traveled home along the shallows in front of the bluffs, I spotted the distinct black dorsal fin of a single male Killer Whale. I was astounded at the height of the fin. Stopping the boat, I collected the binoculars to have a closer look but was startled by the loud barking of my two Brittany spaniels in bow of the boat. Turning, I too was startled to find a pod of about seven Killer Whales converging on my boat. The two dogs had heard the distinct animal whooshing of the Killer Whales blowing and this is what alerted them. The bright setting sun had blocked my view of this subpod of what soon became apparent as a much larger traveling pod. Inshore was the single bull, in front and closing fast, was the group of seven, parallel already was another group of six, and further out were two pairs. It was a west coast memory that still fills me with awe. As an outdoor writer, I do try to work on the principle of being prepared, something my vast wilderness travels has ingrained in me. There were two cameras in the boat, each loaded with film, and a dozen spare spools of film available. Except for the fact that I would be taking photos looking into the sun, it was a photographer's dream opportunity. 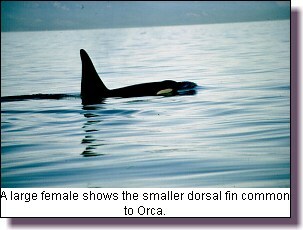 British Columbia is recognized as having large populations of Killer Whales. They are distinguished as living in at least four communities; northern resident, southern resident, transient and offshore. This appeared to be one of the regular pods of the Strait of Georgia, what is now classified as Southern Residents. If you were to cut Vancouver Island in half, from Comox through to Alberni Inlet, the southern Island surrounding waters of the Strait of Georgia, Haro Strait, Puget Sound and the Juan de Fuca Strait are the home waters for these southern residents. The closing pod soon surrounded my boat and I put the propeller into neutral as they swam by, two on one side of the boat and five on the other side. The two were so close that I lost focus on the camera with the telephoto lens and I had to switch to the other which had a standard lens. The pictures were taken fast and furious as the seven closed the distance to the boat, swam beside, and then proceeded past. Both dogs were also in a state of awe as the dark dorsal fins cut the nearby water and the deep whooshing sound occurred as each Killer Whale broke the surface to 'blow'. After the first warning barks I never heard from them again. 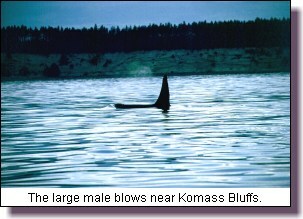 One massive male or 'bull' Killer whale stands out in my memory. As he swam past the boat, only short meters from the side, I was certain I had to look up at the tip of the dorsal fin, it was that large. When you realize that I am 6 ft. 2 inches in height, and, I was standing on the bottom of my boat which was only a few inches below the surface, you can get a feeling for the immensity of this special Killer Whale. 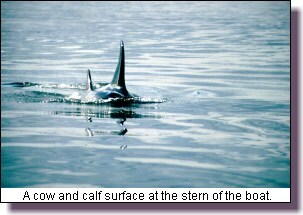 On the other side I had a classic view of a calf swimming very close to a female, obviously the mother. According to a pamphlet produced by the Canadian Department of Fisheries and B.C. 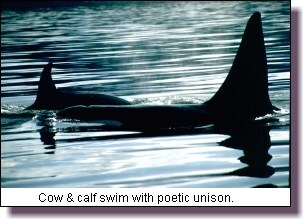 Parks of the British Columbia Ministry of Environment, Lands and Parks, Killer Whales have a complex social structure. They state, "The resident communities are made up of successively more closely related units: pods, supods and matrilineal groups. Matrilineal group: a female and 1-3 generations of her descendants. 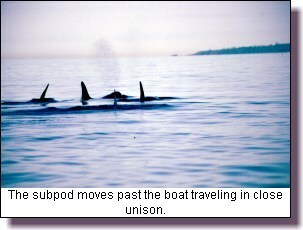 Subpod: one or more matrilineal groups which may temporarily separate from the pod to travel independently. Pod: one or more subpods that travel together most of the time. Throughout their lives, members of a matrilineal group remain within hearing distance of each other. In most large mammal societies, male and/or female offspring disperse after a period of time to set up their own territories. 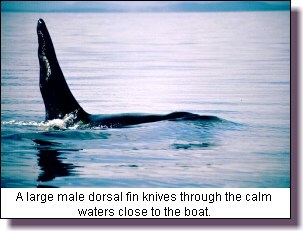 Resident Killer Whale society is unique in that males remain with their birth group throughout their lives. Females may gradually spend less and less time with their birth group as they become the matriarchs of their own matrilineal group." This chance occurrence was one more exciting experience I have had with these special marine mammals of our coastal waters. As they were in small groups, subpods, I have decided that they belonged to one of the major southern resident pods. After the group of seven passed, I was able to turn my boat, and with the sun now behind me, I snapped more and more pictures. I discovered when I finished that I had been able to take 8 rolls of 36 slides each from this brief encounter. 'Film is cheap-opportunity is rare', the outdoor photographers creed was true on that trip. To see Killer whales is a rare experience in our British Columbia wilderness. It is an opportunity to savor, an opportunity to be thankful that we share these waters with such a benevolent marine mammal. I have a special place at the front of my boat for my binoculars, close so that I can quickly scan any dark object on the horizon to once again have the opportunity to watch and observe the antics and behaviour of these majestic British Columbia mammals.